Despite the OECD’s claims that one in three Australian pensioners live in poverty, a Victorian Government-funded study by Mercer has ranked Australia’s retirement income system as one of the world’s best. Released this month, the Melbourne Mercer Global Pension Index (MMGPI) compared the retirement income systems of 27 countries and gave each of them a grade and index score. 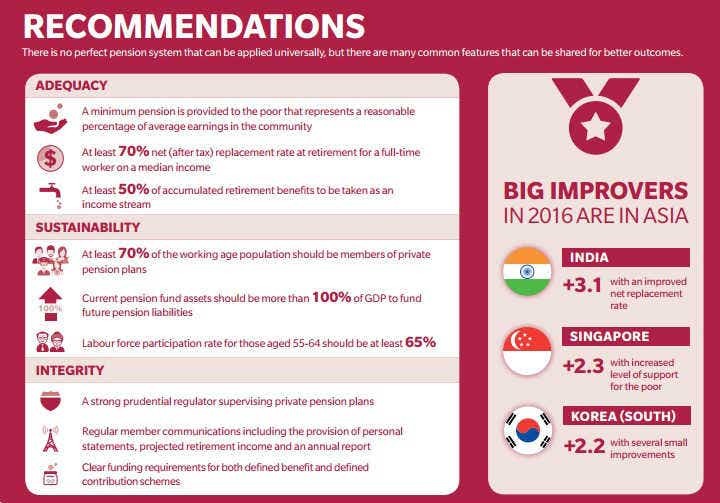 The study aimed to put the spotlight on pensions around the world and encourage improvement in retirement structures. Australia’s retirement income system placed third – after Denmark and the Netherlands – with an overall index score of 77.9. This gave Australia a grade of B+. Denmark and the Netherlands were the only countries to receive an A grade (overall index score of 80 or higher) for their retirement income system. 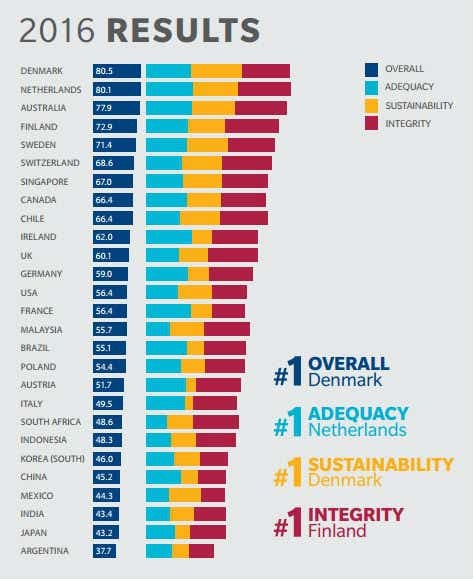 But Australia’s impressive ranking contradicts the OECD’s recent report – Pensions at a Glance 2015 – which placed the country as second worst for social equity compared to 33 other countries. This widely reported study, released in December 2015, identified that more than one-third (36 percent) of Australians over 65 live below the poverty line compared to the OECD average of 16.6 percent. Only South Korea performed worse, with 50 percent of elderly living in poverty. So how has the MMGPI ranked Australia’s pension system so highly? In reality, Australia’s current retirement income system does stack up reasonably well against most of the report’s selected criteria. This is why Australia scored highly in each sub-index. So if our system is one of the world’s best, why then does the OECD’s Pensions at a Glance 2015 report identify Australia as having one of the highest rates of poverty amongst people over 65? Will you retire wealthy or poor? Is the poverty rate of older Australians really that high? Here are a few reasons why there might not be as many poor Australians over 65 as that OECD statistic leads us to believe. The OECD draws the poverty line at 50 percent of the country’s median disposable household income. It’s worth noting that Australia’s median income is quite high by world standards. Comparatively, in judging the adequacy of a country’s minimum pension, the MMGPI went off the suggestion that a minimum pension of only about 30 percent of national average earnings adequately meets the poverty alleviation goal. In the OECD report, it’s pointed out that South Korea, Australia and Switzerland have much a higher poverty rate amongst older people than amongst the general population. In South Korea, this is down to its immature pension system. But the OECD report also suggests that the reason older people are income poor in Australia and Switzerland is because many people take their accumulated pensions as lump sums rather than annuitising them to provide income streams. So instead of receiving regular gradual payouts out of their super, many choose to live off one big withdrawal of their super. This would classify more Australians over 65 as income poor. The latest figures from the Australian Bureau of Statistics (ABS) report that only around one in four Australians over 65 take an income stream. The OECD’s calculations don’t deduct the cost of housing in assessing household disposable income. Most older Australians own a home with no mortgage debt. In fact, in 2011, 71 percent of Australians over 65 owned their home outright, according to the Australian Institute of Health and Welfare. So if housing costs were subtracted from disposable household income, the median Australian disposable household income would be lower – thus less Australians over 65 would be classified as living in poverty by OECD definitions. Considering receiving your super in an income stream?